Rhythm2Recovery present their two day training program that provides professionals working in the Health, Education and Personal Development fields with the skills to implement a wide range of fun and engaging rhythmic musical exercises linked to positive changes in social and emotional wellbeing. This evidence based training will leave participants with the skills necessary to employ rhythmical musical activities, linked to reflective discussions, in their practice, in a practical and impactful way. No prior musical experience necessary. 2 Days of practical and fun exercises for use across a wide range of settings, and with diverse populations, for social and emotional development. 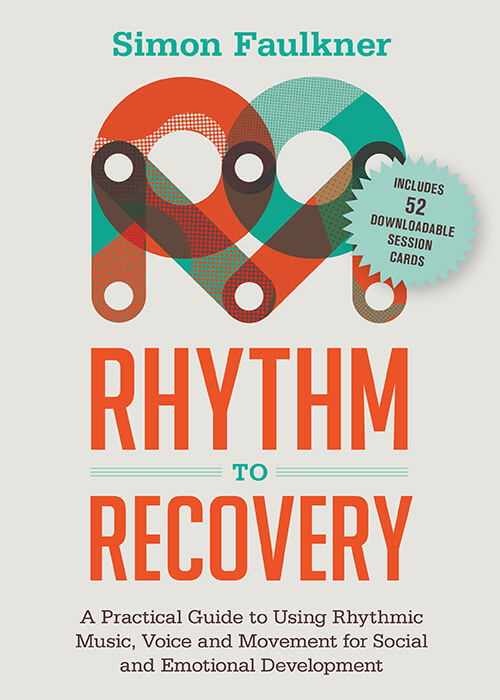 The Rhythm2Recovery model – linking the evidence of what works in therapy to rhythmic activities for individuals and groups. The Rhythm2Recovery model – key principles of effective practice, and a flexible template for client centred, rhythm based practice. Learn how to utilise rhythm in therapeutic and educational settings with this practical guide. This book presents a model of practice alongside examples of fun, interactive exercises.